Cloth Diaper Revival: Which cloth diaper style is best for you? 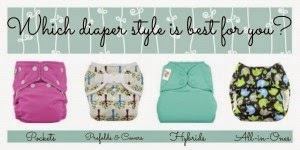 Which cloth diaper style is best for you? Are you new to cloth diapers and completely overwhelmed by all of the different types of cloth diapers on the market? All in ones, prefolds, pockets, hybrids...where should you start? If you're confused about cloth diapers and aren't sure where to start, head over to my post on Kelly Wels' blog for more info on which cloth diapers style may be best for you!